The last (but definitely not least) feature in our Women’s History month Series is Elizabeth Solomon, the Founder and CEO of King David Tacos! Liz’s mission is to bring her Texas-style breakfast tacos to the hustle and bustle of corporate life in NYC and these tacos does not disappoint! Delicious and filling, they’re exactly what you need to spice up breakfast at your office or prepare you for a long day of meetings. Did we mention the queso? (drool). 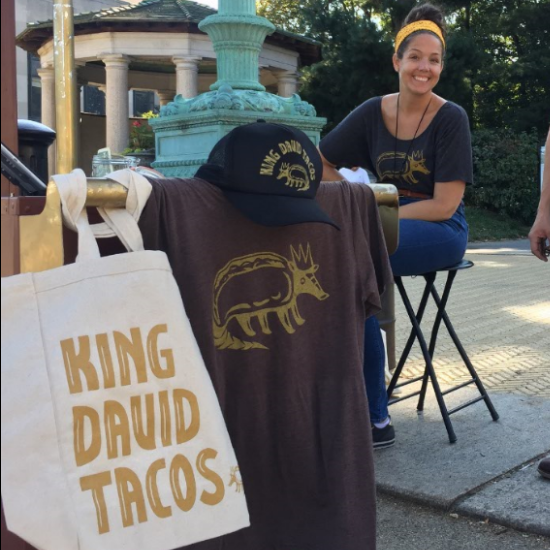 King David Tacos (KDT) is a woman-owned and Brooklyn-founded business, established in June 2016. We aim to bring one of the best exports from Austin, TX to the daily lives of New Yorkers: breakfast tacos. We got started just like any good business—on a wing and a prayer…right? But seriously, we started this crazy journey after I had just about burned out on the advertising industry. So I decided to pursue every Texan-in-New York’s dream: bringing a food to NYC that is so prevalent in Texas and makes so much sense for the New Yorker lifestyle but is nowhere to be found…until now! We are focused on making breakfast tacos that are simple and delicious, and we tailor everything we do to the fast-paced lifestyle of discerning New Yorkers. We opened NYC’s first breakfast taco cart at Grand Army Plaza in Prospect Park in September 2017 and the second cart opened on Wall Street in November 2017. But we’ve been catering to offices all over NYC since we started! Besides being a forever homesick Texan, King David Tacos was actually inspired by my dad, David. He was called “King David” in jest by friends and colleagues- he was a big, burly guy who really could command a room. He loved New York, he loved food and he was really passionate about the idea that NYC needed a breakfast taco cart. King David Tacos is in homage to him. But beyond all the mushy stuff, I do believe that there is/was a big hole in the market for a wholesome, satisfying (without being indulgent), grab & go breakfast. Besides the fact that breakfast tacos bring people joy (as do most tacos), we are also filling a need. What is the biggest/hardest lesson you’ve learned through running a business? Everything is hard when you’re running a business! But the hardest part (in food specifically) is consistency. I think that’s something we can really pride ourselves on now- a consistent product. I don’t think people realize how much work it takes restaurants to output the same dishes over and over, giving you, and the person after you, and the person after that, the same experience every time. Obviously a lot of successful restaurants do just that but before I was really behind the scenes, I couldn’t appreciate the work that goes into creating consistency. I mean, you’re dealing with people and so many other factors, not just machines (at least in most kitchens)! But big picture, I think the hardest thing that I’ve had to learn, or really, the biggest challenge for me, especially since I changed industries, is how to build our employee base properly. I’m really lucky to have a core team now that I trust immensely. But it took time and some anguish to get here. Back in the day in advertising, when I was hiring people to work on my accounts, I was hiring people that are pretty much like me. People that are going to help me do my job and probably do a lot of the same things day-to-day that I do. But when it comes to running your own business, you’re hiring for all aspects of the operation. You’re hiring someone and then training them and then managing them as well as the rest of your employees and getting everyone to gel and work together like a well-oiled machine. It is a huge challenge! But when it works, it’s hugely rewarding. How do you think being a female business owner has impacted your business? The other part of the answer is, yes, being in food especially, I get some surprised reactions when people realize that the owner/chef is a female (especially being called King David Tacos). At our carts, I’ll be standing with one of our male cart attendants, and consistently, people look at him and ask, “Are you the owner?” I just laugh, and the employee standing with me will laugh too, because it’s an honest assumption. I think it just shows how deeply our societal norms are ingrained, no matter your intentions. The flip side of that is that I get a lot of bonus excitement by women and men alike to support a woman-owned business. Working with FoodtoEat means that you support the mission to promote female, minority and immigrant run businesses. Why do you think the FoodtoEat mission is important? The mission is important from an economic perspective for sure. Diversity of ideas breeds better business, and all of that. But taking it a bit further, I think that we come at it from a unique perspective too, because half of the mobile food vending businesses are actually minority and immigrant-run (at least in NYC). It’s important to highlight innovation and support good business coming out of these kinds of industries because being in the minority— whether it’s via gender, race, sexuality, ethnicity— can put you at an automatic disadvantage. But having people look out for you and lift you up benefits the group (I mean the human race, the world) as a whole. We all rise together. What would be your advice to other female entrepreneurs that are trying to start their own business? Learn to trust your intuition, be persistent, and get comfortable being uncomfortable. When you have an idea that’s new, it’s going to receive push-back. You need to be strong enough to (a) navigate and course-correct when needed but (b) also know when to barrel forward.